Are you considering getting into spiritual blogging? Or just wondering what it's all about? Let me just start by saying, that I absolutely love the process of spiritual blogging. There’s a special kind of magic in putting your spiritual ideas and concepts into writing, sharing your inner wisdom, writing about what you’re learning, or simply documenting your spiritual journey with a blog. The very process of going from experiencing something, learning more about it, and then putting it into writing offers an incredible opportunity for integration. Stepping into being of service is an essential step on the Ascension path. As you spiritually awaken, you begin to understand who you really are. You gain insight into how the world works and you naturally align with your own unique perspectives on life, spirituality, and the greater workings of the Divine and Universe. As this happens, it’s natural to begin to share what you’re learning, implementing and integrating with others. Stepping into being of service through sharing, not only takes your learning to a new level as you more deeply integrate your experiences through teaching, but it sparks the fire of learning in you as well as you strive to further grow, learn, and ascend in order to further share your experiences with others. Through this process of service and sharing with others, the cycle of learning and teaching unfolds, and you continue to progress on your personal path. More of your spiritual gifts, psychic abilities, and skills begin to open, and you have even more to share and support others in growing, as you too continue to reach new heights and ascend into new dimensions and levels. You’re able to inspire others, share from your heart, and stay inspired in the process! Spiritual blogging is such a wonderful way to step into serving others. Through sharing your experiences, what you’re learning about, what you’re knowledgeable about, what you’re integrating, and even what you’re feeling stuck on and still learning… You’re able to help others along on their path, as you simultaneously integrate at a deeper level by stepping into the flow of learning and teaching. For many, the step of beginning to share their spirituality with others can be a bit tricky. I hear from so many people that they live in communities, and are surrounded by people who just aren’t open to spirituality, or even fear, judge and resist it. Don’t let this stop you! 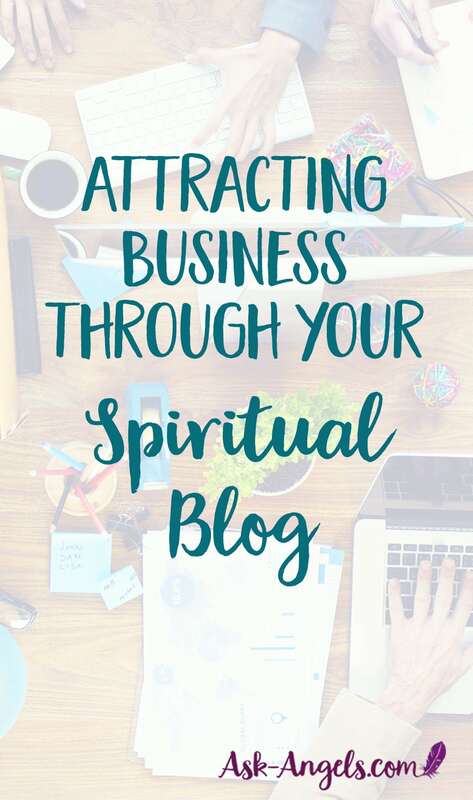 You’re online reading this now which means you have the ability to globally reach people, and a spiritual blog is one of the best ways to do this! Being of service through spiritual blogging is not about trying to get anything from others. The best spiritual bloggers are those who openly give from the heart, freely share, and guide others as they continue to grow, learn, integrate and progress on their own spiritual paths. How to Start A Spiritual Blog! Starting your spiritual blog off right is key. Perhaps the most important thing to keep in mind, is that a website in its very nature is an ongoing project. I can't tell you the number of people I have met who have paid top dollar to companies to build them a website… Promising traffic, sales and more… Only to find out, that it just doesn't work this way. Are you an Angel Card Reader, Psychic Medium, Channel, Energy Healer, Massage Therapist, Reiki Practitioner, Shaman, Crystal Healer, Astrologer, or do you offer any other type of spiritual sessions or services? One of the best ways to market your services and promote your sessions is to start sharing your ideas, empowering beliefs, philosophies, experiences, and inspired teachings through a blog. I don’t mean you should try to sell your services through your blog though. Just as I mentioned above, even if you do have something to sell… Allow your spiritual blogging be where and how you give back. Let spiritual blogging be an avenue of being of service to others. Really give, share, teach, and help others through your blog… And if people resonate with your writing, and what you’re sharing and teaching … Some of your readers will naturally want more from you, including your paid products and services! They’ll be much more likely to want to do business with you! 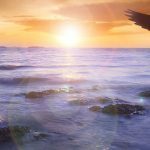 In addition to using Spiritual Blogging as a way of promoting your readings, energy healing sessions, or services, there are more ways you can make money! Check out the Top 11 ways Spiritual Bloggers Make Money here! Want to promote your spiritual business and share from your heart online but you don’t feel like writing is a strength of yours? The great news is, spiritual blogging has evolved from being a way for a select few to share their ideas through websites… Into a completely vast and multi-media field, where we can all share, learn and grow with each other. Blogging is probably for you. Write from your heart, document your spiritual path, and share your inner inspiration with others. Enjoy talking your ideas out? Or do you love the idea of interviewing other spiritual experts? Really just want to share your inspiration on Instagram or Facebook? This can work too! This is actually called micro-blogging and while I see it more as a way of supporting a blog, podcast, or YouTube channel, it can be a great way to easily start getting your ideas and inspirations out in the world. There are truly so many channels and opportunities available for you to get your ideas spiritual ideas out there and to serve with love. The key for success with spiritual blogging in whatever format you choose is putting in a consistent effort over time! Many people start a blog and then get discouraged after a few posts because no one is reading it! Learn, share, grow, take steps to attract readers, and keep putting it out there. I would recommend committing to a publishing schedule that is manageable and fits with your lifestyle, but also has you publishing to your blog as often as possible, then stick to it! If you’re been thinking about starting a spiritual blog, let this be a sign that now is the time! The spiritual industry is growing as more and more people awaken to wanting to know and experience beyond the physical. 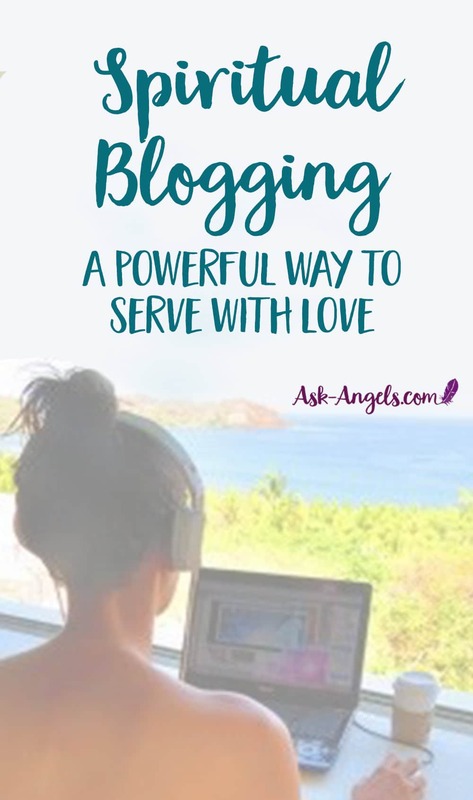 Because spiritual blogging really is a beautiful journey of love, service, growth, and inspiration. P.S. Do you have a spiritual blog? Was this post helpful for you? Want more articles on how to become a professional blogger? Or how to market your blog and attract readers? Or just click here to read more of my Spiritual Blog now! Thank you for such an encouraging article. I started my blog just a few weeks ago and not many people have visited my site and read my posts but I will keep going. Please write more about how to market and get more readers! The universe has brought me to your site. The past month, I had lost my job as a Videographer for a small local business. I felt my world turn upside down, because I had no control over what would happen next.. I picked up “The Universe has your back” by Gabrielle Bernstein (a book a dear friend lent me over a year ago) (and I would recommend to everyone) it had been sitting in the trunk of my car. The minute I tuned in, I felt weightless and guided. Over the month, I learned the lessons in each chapter, my faith rewarded miracles. I have never felt more in love with my soul and spirit. I called on the Holy Instant and reassured that the Universe is taking care of it. I step back and believe truth is my name, I am being guided. It wasn’t until yesterday that I had an universal assignment that I failed at. I didn’t realize it until the situation had been over. All my energy was drained out of me until I called out my truth, accept you are being guided..
Today, December 29, 2017 is the first time a Universal Assignment had been placed infront off me in which for the first time in a long time I felt in control . Physically and mentally. I said it out loud and I believe it. The thought; “spiritual path career” glows in my mind.. I typed it in my search bar and clicked in the site “ask Angels” it just felt right. Today guided me to you. I awakened a year ago and have learnt so much! My learnings, experiences and events is something I simply have to share. I feel so strongly about what’s happened to me, the daily struggles, not understanding what’s going on, feeling completely isolated and lonely that I feel I must share this with others. I couldn’t bare to think others could go through what Iv been through so therefore want to share my experience, learning and findings. I believe I have a unique intuition and my birth path is a master number! Very intuitive and phychic. Share my experiences, share my knowledge Iv accumulated over time and speak from the heart. My ultimate passion is to help others going through this and I know this is the perfect time and opportunity as a lot of people are waking up this year. I am extremely focused and will want my blog to success. Therefore I will help each and everyone who comments. There will be nothing more rewarding for me than knowing I can help others and be of comfort and support. So glad to hear Sasha! I’m working on a great step-by-step guide to starting a spiritual blog I’ll have for you soon! Thank you for this post! My journey was recently initiated by my husbands and it’s been an amazing experience I feel compelled to share. Your post really gave me reassurance that this is something I should do. 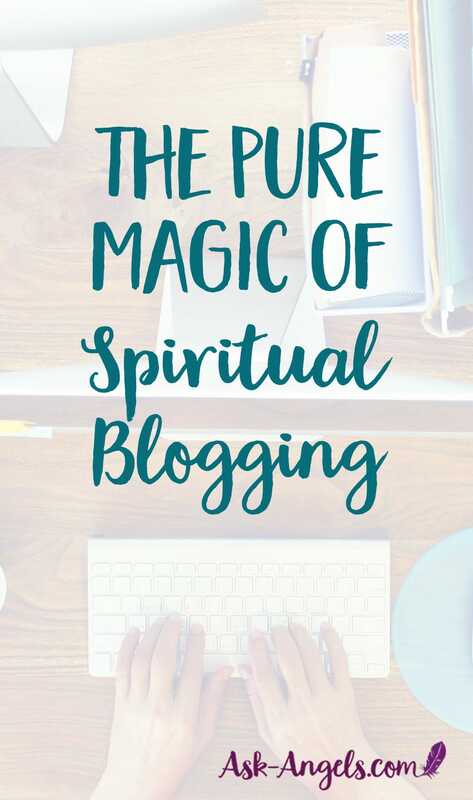 So glad to hear this was reassuring for you… I’m going to be putting out some more free resources for Spiritual Blogging soon!